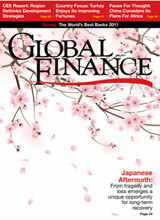 In the past few weeks we all focused on Japan, shared its pain and its terrible losses. Many wondered about the risks that the crises in that country and in the Middle East might inflict on the global economy. 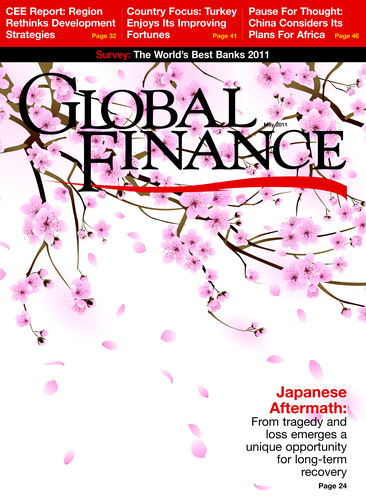 At Global Finance , we decided to investigate to what extent the tragedy of the earthquake, the tsunami and the nuclear disaster that followed could become the catalyst for major change in Japan, beyond the expected growth due to the massive investment in reconstruction. The opinions on this matter, which are at the core of Michael Shari’s cover story, were not unequivocal. It is not a surprise, since there are many possible scenarios and very few precedents for this situation. This month, we put a major editorial and analytical effort into selecting the list of the best banks both in developed and developing countries. Given the continuing upheaval roiling the world’s markets, for most of our writers selecting the winners in each country and each region has not been an easy task. It also, though, represented a useful opportunity to focus again on local and regional banking issues. In this issue we also focus on many different economies: from Turkey, the fastest-growing European economy on the eve of elections as described by Justin Keay, to Central and Eastern Europe. Jonathan Gregson describes the economy of Kazakhstan, and Vanessa Drucker focuses on the effect the eurozone debt crisis is having on countries in Central Europe. In a different part of the world, Antonio Guerrero looks at China’s strategy in Africa in light of the recent unrest in the north of the continent. On the macroeconomic scene one of the more recent developments in the financial markets has been the simultaneous and widespread raising of interest rates around the world—from Europe, to China, India, Brazil and Taiwan in recent months—while in the US the Fed will complete next month its second round of quantitative easing. Recently Philip Poole, global head of macro and investment strategy for HSBC Global Asset Management, told us in New York that his bank forecasts that every emerging market economy, with the notable exceptions of South Africa and Hungary, will raise interest rates in the next 12 months, together with the European Central Bank and the Bank of England. This is a trend that will affect the global economy in the coming months, and probably years. The other key issue that many countries—especially in the emerging markets—are tackling is inflation. Our focus will increasingly be on these issues.